Patience Pays Off! - 11/5/2017 — Pyramid Fly Co.
Big fish season is among us and we couldn't be more excited! Prior lake turn overs have settled, colder night temps are cooling down the water, winter storms are starting to bring wind and clouds and the list goes on. 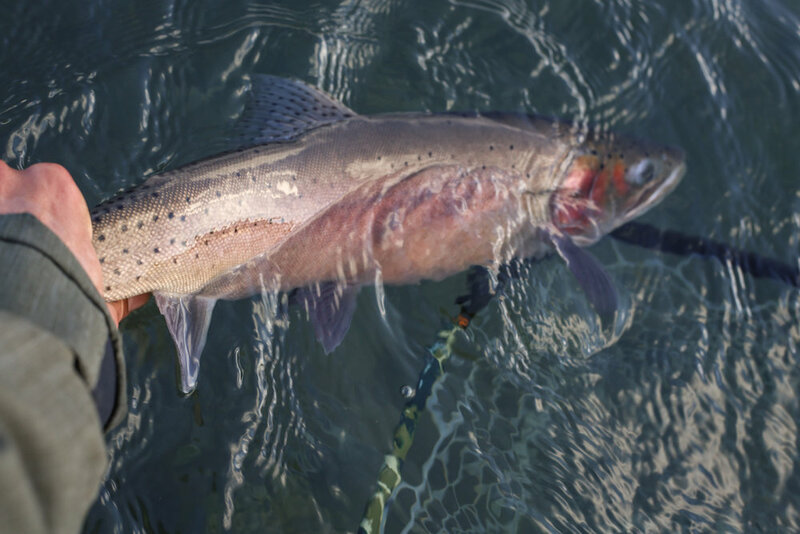 If you are on the hunt for your trophy Lahontan Cutthroat then you better get out to the salty oasis and get a line wet. Mild winter storms have started bringing in big fish this past week and continuing into the weekend. The high pressure blue bird days can be battle and the numbers may not be extreme this time of year even with great conditions. Though the odds of one of those grabs being a 10+ pound fish are getting better and better. It seems as though the Pilot Peak thrive in slightly colder temperatures than the pyramid strain. 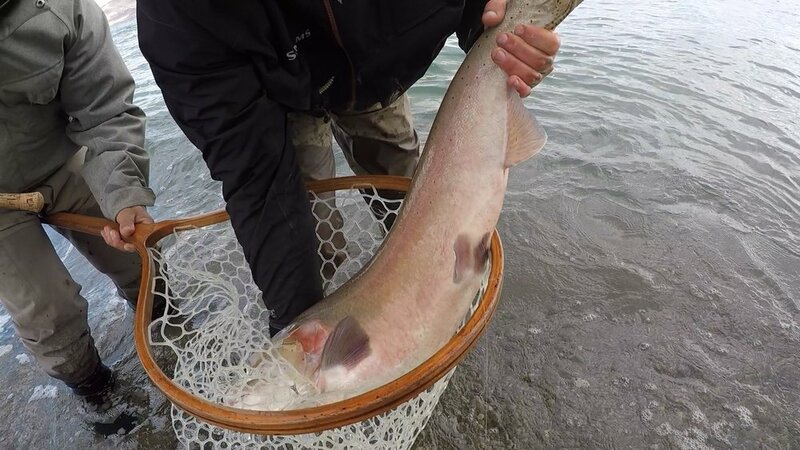 This meaning cold temperatures in the shallows allows for longer periods of time for the larger fish to come close to shore to party and gorge themselves. The absolute best weapons this time of year that supersedes all others is TIME ON THE WATER and PATIENCE. I can't reiterate this enough. Countless times have we had very slow days where you may only get 3-5 grabs but we have landed multiple fish over 10lbs on some of those days. Putting in work on the water in these next couple months may be a little strenuous at times but boy can it pay off 100 fold. Now regarding Fly choice, your baitfish patterns will still be the go to either stripping or under an indicator. The boobies and popcorn beetles of all colors have been top producers, followed closely by the wooly buggers and clousers. Again, varying your cadence in your retrieve will be beneficial on finding how active fish are and what speed will get them going. As water begins to really cool down try fairly slow pace then pick up speed as time goes on (say 10-20 minutes) and then repeat until we find the happy retrieve. When the wind comes in it doesn't hurt to try an indicator rig with a balanced leech or baitfish. Fly colors for both techniques should also be interchanged through the day. Good starting points will be black olive and white. Just be ready because November and December can go from 0-60 in the blink of an eye. (Insider tip) We caught and saw more 20+ pound fish in November and December than any other time of the season last year. Chew on that thought while reading this in your sweatpants debating on if it's too cold to go out or not.